Writing for GreenMedInfo, Claire Edwards, a former editor and trainer in intercultural writing for the United Nations (U.N.), warns that 5G might end up being the straw that breaks the camel’s back in terms of the state of public health. Electro-hypersensitivity (EHS), she says, could soon become a global pandemic as a result of 5G implementation, with people developing severe health symptoms that inhibit their ability to live normal lives. This “advanced” technology, Edwards warns, involves the use of special “laser-like beams of electromagnetic radiation,” or EMR, that are basically blasted “from banks of thousands of tiny antennas” installed all over the place, typically on towers and poles located within just a couple hundred feet of one another. While she still worked for the U.N., Edwards tried to warn her superiors about the dangers of 5G EMR, only to have these petitions fall on deaf ears. This prompted her to contact the U.N. Secretary-General, Antonio Guterres, who then pushed the World Health Organization (WHO) to take a closer look into the matter – though this ended up being a dead end as well. For more news about 5G and its threat to humanity, be sure to check out Conspiracy.news. Edwards worries particularly about 5G implementation in space, as existing space law is so woefully inadequate that countries all around the world, including the U.S., will likely blanket the atmosphere in 5G equipment, turning our entire planet into an EMR hell. Elon Musk of Tesla fame is one such purveyor of 5G technology who’s planning to launch an astounding 4,425 5G satellites in to Earth’s orbit by June 2019. This means that, in a matter of just a few months, 5G will be everywhere and completely inescapable. “There are no legal limits on exposure to EMR,” Edwards writes. 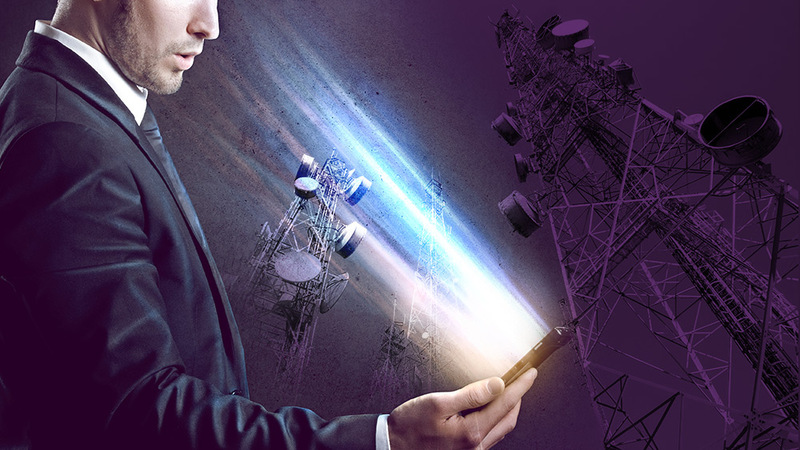 There’s already evidence to suggest that 5G implementation in a few select cities across the United States, including in Sacramento, California, is causing health problems for people who live near 5G equipment. At firehouses where 5G equipment was installed, for instance, firefighters are reporting things like memory problems and confusion. Some people are also reporting reproductive issues like miscarriages and stillbirths, as well as nosebleeds and insomnia, all stemming from the presence of 5G transmitters. Edwards encourages folks to sign The Stop 5G Appeal if they care about protecting people, animals, insects, and the planet from this impending 5G assault. “Our newspapers are now casually popularizing the meme that human extinction would be a good thing, but when the question becomes not rhetorical but real, when it’s your life, your child, your community, your environment that is under immediate threat, can you really subscribe to such a suggestion?” Edwards asks. Three years ago, Nasa’s New Horizons, the fastest spaceship ever launched, raced past Pluto, spectacularly revealing the wonders of that newly seen world. This coming New Year’s Eve – if all goes well on board this small robot operating extremely far from home – it will treat us to images of the most distant body ever explored, provisionally named Ultima Thule. We know very little about it, but we do know it’s not a planet. Pluto, by contrast – despite what you’ve heard – is. Why do we say this? We are planetary scientists, meaning we’ve spent our careers exploring and studying objects that orbit stars. In 2006, the International Astronomical Union (IAU) announced an attempted redefinition of the word “planet” that excluded many objects, including Pluto. We think that decision was flawed, and that a logical and useful definition of planet will include many more worlds. We find ourselves using the word planet to describe the largest “moons” in the solar system. Moon refers to the fact that they orbit around other worlds which themselves orbit our star, but when we discuss a world such as Saturn’s Titan, which is larger than the planet Mercury, and has mountains, dunes and canyons, rivers, lakes and clouds, you will find us – in the literature and at our conferences – calling it a planet. This usage is not a mistake or a throwback. It is increasingly common in our profession and it is accurate. Most essentially, planetary worlds (including planetary moons) are those large enough to have pulled themselves into a ball by the strength of their own gravity. Below a certain size, the strength of ice and rock is enough to resist rounding by gravity, and so the smallest worlds are lumpy. This is how, even before New Horizons arrives, we know that Ultima Thule is not a planet. Among the few facts we’ve been able to ascertain about this body is that it is tiny (just 17 miles across) and distinctly non-spherical. This gives us a natural, physical criterion to separate planets from all the small bodies orbiting in space – boulders, icy comets or rocky and metallic asteroids, all of which are small and lumpy because their gravity is too weak for self-rounding. The desire to reconsider the meaning of “planet” arose because of two thrilling discoveries about our universe: There are planets in unbelievable abundance beyond our solar system – called “exoplanets” – orbiting nearly every star we see in the sky. And there are a great many small icy objects orbiting our sun out in Pluto’s realm, beyond the zone of the rocky inner worlds or “terrestrial planets” (such as Earth), the “gas giants” (such as Jupiter) and the “ice giants” (such as Neptune). But the process for redefining planet was deeply flawed and widely criticised even by those who accepted the outcome. At the 2006 IAU conference, which was held in Prague, the few scientists remaining at the very end of the week-long meeting (less than 4 per cent of the world’s astronomers and even a smaller percentage of the world’s planetary scientists) ratified a hastily drawn definition that contains obvious flaws. For one thing, it defines a planet as an object orbiting around our sun – thereby disqualifying the planets around other stars, ignoring the exoplanet revolution, and decreeing that essentially all the planets in the universe are not, in fact, planets. Even within our solar system, the IAU scientists defined “planet” in a strange way, declaring that if an orbiting world has “cleared its zone”, or thrown its weight around enough to eject all other nearby objects, it is a planet. Otherwise it is not. This criterion is imprecise and leaves many borderline cases, but what’s worse is that they chose a definition that discounts the actual physical properties of a potential planet, electing instead to define “planet” in terms of the other objects that are – or are not – orbiting nearby. This leads to many bizarre and absurd conclusions. For example, it would mean that Earth was not a planet for its first 500 million years of history, because it orbited among a swarm of debris until that time, and also that if you took Earth today and moved it somewhere else, say out to the asteroid belt, it would cease being a planet. To add insult to injury, they amended their convoluted definition with the vindictive and linguistically paradoxical statement that “a dwarf planet is not a planet”. This seemingly served no purpose but to satisfy those motivated by a desire – for whatever reason – to ensure that Pluto was “demoted” by the new definition. The storm bigger than the Earth, has been swhirling for 350 years. The image’s colours have been enhanced after it was sent back to Earth. By and large, astronomers ignore the new definition of “planet” every time they discuss all of the exciting discoveries of planets orbiting other stars. And those of us who actually study planets for a living also discuss dwarf planets without adding an asterisk. But it gets old having to address the misconceptions among the public who think that because Pluto was “demoted” (not exactly a neutral term) that it must be more like a lumpy little asteroid than the complex and vibrant planet it is. It is this confusion among students and the public – fostered by journalists and textbook authors who mistakenly accepted the authority of the IAU as the final word – that makes this worth addressing. Last March, in Houston, planetary scientists gathered to share new results and ideas at the annual Lunar and Planetary Science Conference. One presentation, titled “A Geophysical Planet Definition”, intended to set the record straight. It seems very likely that at some point the IAU will reconsider its flawed definition. In the meantime, people will keep referring to the planets being discovered around other stars as planets, and we’ll keep referring to round objects in our solar system and elsewhere as planets. Eventually, “official” nomenclature will catch up to both common sense and scientific usage. The word “planet” predates and transcends science. Language is malleable and responsive to culture. Words are not defined by voting. Neither is scientific paradigm. Grinspoon is an astrobiologist who studies climate evolution and habitability of other worlds. Stern is the principal investigator of the New Horizons mission to Pluto and the Kuiper belt. Their book “Chasing New Horizons: Inside the Epic First Mission to Pluto,” was published May 1 by Picador. Transnational corporations, or TNCs, or just plain big businesses, are everywhere. They have an overwhelming influence and impact on our lives—and on the planet. They boast they are a force for good—and are helping in the fight against climate change. But Peter Dauvergne, professor of international relations at the University of British Columbia in Canada, begs to differ. “The earth’s climate is drifting into an ever-deeper crisis as the shadows of mass production, transportation and industrial agriculture continue to intensify,” said Dauvergne. The buzz word among TNCs is sustainability: TNCs see themselves leading the struggle to build a better world, in which resources will be ever more carefully managed—and climate-changing greenhouse gases reduced. “We are entering a very interesting period of history where the responsible business world is running ahead of the politicians,” said Unilever, the giant Anglo-Dutch consumer goods company. With their global reach and enormous financial resources—which dwarf those of many countries round the world—TNCs say they are ushering in a sustainable future. But trusting big business to lead sustainability efforts, says Dauvergne, is like trusting arsonists to be our firefighters. He does point out that TNCs are doing many good things. For example, Walmart—the world’s biggest company by far—uses solar panels on its stores, recycles increasing amounts of its waste and donates millions of dollars to environmental causes, including the fight against climate change. Technology giants like Google and Apple have switched to using renewable energy across their operations. TNCs spend billions each year on pressing home their sustainability message, stressing their adherence to the code of Corporate Social Responsibility (CSR). Dauvergne says TNCs have amassed extraordinary financial resources. The top 500 corporations in the U.S. now account for two-thirds of the country’s gross domestic product. Mergers and takeovers, with small businesses being gobbled up, have led to an ever greater concentration of corporate wealth and power. A handful of giant companies has enormous influence on global agriculture—controlling fertilizer and pesticide production and, most importantly, the availability of seeds. TNCs, says Dauvergne, encourage both overconsumption and rising rates of unequal consumption. They use their financial clout and their teams of accountants and lawyers to avoid taxes—and to reap more profits for their shareholders. Tax avoidance is severely damaging, especially to developing countries where losses of billions of dollars in revenues result in increased poverty, inadequate social services and weak environmental enforcement. Maybe the TNCs have come to believe their own propaganda, but the degree of corporate chutzpah is, at times, amazing to behold. McDonald’s boasts that it is “helping to lead a global movement on beef sustainability.” BP, responsible for spewing millions of barrels of oil into the Gulf of Mexico, says sustainability is at the heart of its corporate strategy. VW, which installed technology in millions of its cars to shut off pollution controls, says it abides by transparent and responsible corporate governance. For the good of the future of the planet, the public—and governments—must confront big business, says Dauvergne: the corporate world is never going to be turned into a force for social justice and planetary sustainability. “Any chance of stopping big business from destroying much of the earth will require governments and societies to reorient global environmental policies to reduce—and then restrain—the power of big business. Ever since Pluto lost its planet status back in 2006, most of us have been waiting for the day scientists change their minds and restore it. Last month, we had new hope that might happen, with NASA researchers proposing a new, broader definition for a planet. But now astrophysicist and Forbes science columnist Ethan Siegel has crushed that hope somewhat, penning a thorough takedown of why, scientifically speaking, Pluto won’t ever be a planet again. Warning: those of you still in denial about our former ninth planet should probably brace yourselves. 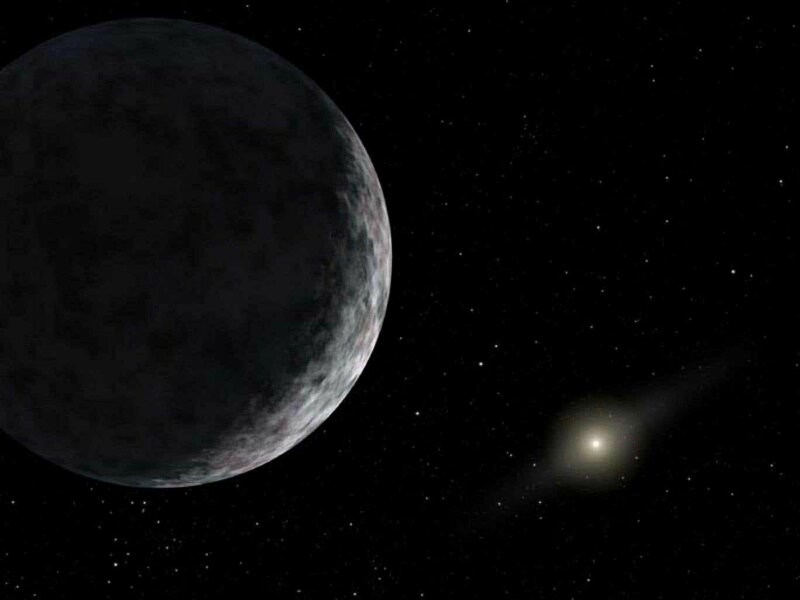 According to Siegel, who’s a professor of physics and astronomy at Lewis & Clark College in Portland, Oregon, Pluto might be one of the most-loved objects in our Solar System, but that doesn’t mean it’s eligible for planet status. In fact, trying to make it a planet again could hurt scientific progress going forward. “There’s something very meaningful about our place in the Solar System that makes Earth a planet and Pluto not-a-planet. If we’re being honest about our Solar System and the number of planets within it, there are very clearly eight objects that are different from all the others,” he added. For those who aren’t up to date on Pluto’s planetary status, let’s refresh. Pluto was discovered back in 1930, hiding in the asteroid belt at the edge of our Solar System. At the time, it was thought that Pluto was more massive than Earth, but over the years, observations revealed that our ‘ninth’ planet was actually a lot smaller than we thought – just half the size of Mercury. Then, in the 1990s, researchers began discovering other trans-Neptunian objects – small objects in our Solar System orbiting the Sun past Neptune. And they weren’t all that different to Pluto. On the back of these new discoveries, the International Astronomical Union (IAU), which defines the objects in our Universe, changed the official definition of a “planet” in 2006, and Pluto was downgraded to a dwarf planet. And it needs to clear its orbit of any planetesimals or planetary competitors. It’s that third point that Pluto fails on. But here’s where things get controversial – that definition is pretty problematic in itself. Firstly, it only defines a planet as existing around our own Sun (and as we know, there are plenty of other planets around extrasolar systems). “‘Clearing its orbit’ seems pretty subjective and dependent on what else is out there. 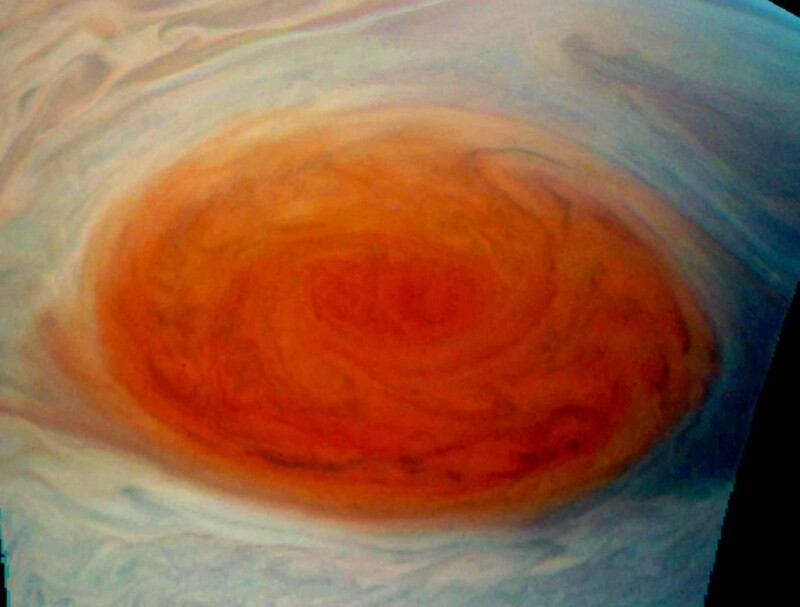 (If you were to place Jupiter too distant from the Sun, it would fail to clear its orbit; would it therefore stop being a planet?). Which is why, for the past decade, members of the public (and some scientists) have held out hope that maybe the definition of a planet will be updated, and Pluto will be reinstated. In fact, last month, NASA scientists wrote up a new definition of a planet for submission to the IAU, and according to their criteria, not only would Pluto be back in the fold, but so would our Moon and more than 100 other Solar System objects. The big difference is that, instead of an astronomical perspective, these scientists are coming from a geophysical one. They say that cosmic bodies in our Solar System don’t need to be orbiting the Sun to be considered planets – we should be looking at their intrinsic physical properties, rather than their interactions with stars. “In keeping with both sound scientific classification and peoples’ intuition, we propose a geophysically-based definition of ‘planet’ that importantly emphasises a body’s intrinsic physical properties over its extrinsic orbital properties,” the researchers explain. Under that definition, Pluto would make the cut. But Siegel doesn’t think geophysics alone is anywhere near specific enough. “In our efforts to include Pluto, we include every non-stellar object more massive than about 0.01 percent of Earth’s mass,” Siegel writes. But he thinks there is a happy medium. If we take into account several of the suggested definitions for planets out there – including the geophysical definition – and also look at some of the more recent solar systems we’ve found, such as the recently discovered TRAPPIST-1 system, we can get a more specific definition. And their orbits, barring any outside influences, will be stable as long as their star exists. When you use that definition, the line becomes a lot less fuzzy. In fact, researchers have actually made a mathematical relationship between an object’s mass and its orbital distance that can be applied to any star. 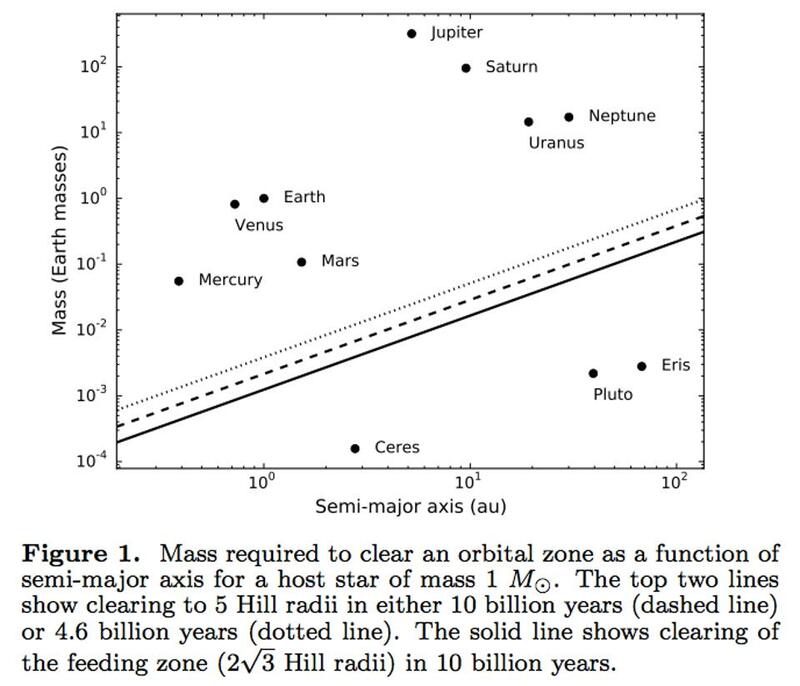 You can see that formula applied to our own Solar System below, in a 2015 paper in the Astronomical Journal by Jean-Luc Margot, an astrophysicist at the University of California, Los Angeles. Of course, this is just the opinion of one group of researchers. Other scientists, including the authors of the proposal put forward last month, still firmly believe there’s room for Pluto at the planetary table. In the coming years, one thing that might sway the debate either way would be the potential discovery of so-called Planet Nine – a huge, hypothetical cosmic body lurking at the edge of our Solar System. Until then, let’s not get too depressed about Pluto’s missing planetary status. Science needs these types of definitions to expand as our knowledge grows. And, you never know, Pluto might one day be redefined as something even more fascinating, as we learn more about the strange types of objects that are out there lurking in space. Space is unbelievably strange. You would be forgiven for thinking that every planet out there is similar, just a big ball of rock and gas, but planets are remarkably more unique than that. Here’s the top 10 strangest planets in the known universe, that seem like they belong in some bizarre science fiction series. The First Aliens We Discover May Be Purple. In our quest to discover strange new life on strange new worlds, a group of astronomers has modeled potential alien worlds using Earth’s biological history as a framework. From this they have determined that if we are to detect extraterrestrial biology, we should fine-tune our search to the color purple. As we discover more and more worlds orbiting other stars in ever more biologically-pleasing orbits, the question “are we alone?” becomes increasingly acute. It’s inevitable that we will soon discover an alien world with Earth-like dimensions, orbiting a sun-like star within its habitable zone. But until we develop the means to remotely probe that world’s atmosphere, we can never be sure if it is truly habitable. Looking for a “true” Earth analog is fraught with challenges. Are we looking for a planet with the same characteristics as modern Earth, or do we try to model our planets during different epochs and work out when Earth life would have been at its most detectable? Life on Earth has been around for the best part of 4 billion years, when would have been best for an alien civilization to detect terrestrial life and what would they have needed to look for? It’s exactly this question that an international team of researchers is trying to answer. 3 billion years ago, during the Archean eon, the Earth was likely dominated by purple bacteria, a photosynthetic microorganism that inhabited the land and ancient seas. These organisms would have had a very distinctive spectroscopic fingerprint and a tell-tail sign that Earth was covered in a basic form of life. When looking for Earth-like worlds, the researchers emphasize the need for exoplanet hunters to be aware that they may not discover a modern-looking Earth-like world, they may stumble across a purple bacteria-dominated world with a very distinctive photometric signature more fitting with an ancient Archean eon Earth-like world. Purple plants may thrive under binary stars. This isn’t the first time that purple alien worlds have been discussed as a possibility. In 2011, researchers examined the exotic energy-generating regimes hypothetical alien plant life would need to develop under sunlight from binary stars. Over 25 percent of sun-like stars and 50 percent of red dwarf stars exist in binary pairs. Should there be any planets in orbit around binary systems, any life — be it flora or fauna, or some alien form of life that we can’t comprehend, let alone categorize — would be exposed to a broad spectra of light, stretching far into ultraviolet wavelengths. The upshot of this would be purple hued (or even black) plant life that has evolved to optimize photosynthesis. It seems that in the hunt for extraterrestrial life, all roads lead to purple. Exoplanet is built like Earth but much, much hotter. Planet has a similar size and density to our world’s but circles its star in just 8.5 hours. wo groups of researchers have for the first time succeeded in measuring the mass of an Earth-sized exoplanet — in this case, Kepler-78b, which is only slightly wider than Earth and orbits a star in the constellation Cygnus, 123 parsecs (400 light years) away. Astronomers are getting better at finding the many small, Earth-sized planets that scatter the Universe outside our Solar System, but finding clues to what they are made of is much harder. The figures for Kepler-78b are published today in Nature, and show that the planet’s density is similar to that of Earth, suggesting that it also has a similar composition of rock and iron. That, however, is where the similarities end. Kepler-78b travels in orbit about 40 times closer to its star than Mercury is to the Sun; its year lasts just 8.5 hours; and its surface is thought to reach a scorching 2,300–3,100 Kelvin. Kepler-78b is one of a recently-discovered class of exoplanets with orbital periods much shorter than one day, says astronomer Francesco Pepe of the University of Geneva in Switzerland, who led one of the teams that calculated the planet’s mass2. 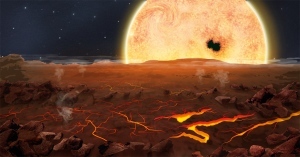 “It can be imagined like a lava planet rather than an Earth-like planet,” he says. It is unclear how Kepler-78b got so close to its star and whether it is falling in further, he adds. The mass of an exoplanet is usually calculated on the basis of the ‘wobble’ motion that the orbiting planet’s gravitational pull exerts on its host star — a motion measured as changes in the speed with which the star moves towards or away from Earth by looking at Doppler shifts in the star’s light. The mass of exoplanets the size of Earth is usually hard to estimate because they have a very small influence on their stars. But Kepler-78b — whose size and orbit were first calculated by a team of astronomers in August3 using NASA’s Kepler observatory — is close enough to its star to cause a measurable wobble. Using data from the High Accuracy Radial Velocity Planet Searcher-North (HARPS-N) spectrograph at the National Galileo Telescope in the Canary Islands, Pepe and his team calculated the planet’s mass at 1.86 times that of the Earth2. This tallied with results of another team led by astronomer Andrew Howard of the University of Hawaii at Manoa, which put the mass at 1.69 times that of Earth, using data from the High Resolution Eschelle Spectrometer on the Keck 1 Telescope at the W.M. Keck Observatory in Hawaii1. “This is a very difficult measurement, so someone might be sceptical if only one of us published,” says Howard. The confirmation makes the results “rock solid”, he adds. Sara Seager, a planetary scientist at the Massachusetts Institute of Technology (MIT) in Cambridge and member of the Kepler science team, says the results represented “an inevitable march towards other Earths”. Earth-like planets in Earth-like orbits are likely to be abundant within the Universe, but because their stars’ corresponding wobble is tiny, finding their mass will considerably more difficult than it was in Kepler-78b’s case. But Pepe thinks that HARPS-N could find Earth-sized planets in wider orbits, if they belong to “quieter” systems, in which low activity on the surface of the star makes the planets’ influence easier to detect. “If we are very lucky,” he adds. Stars’ twinkle reveals their character. In 1806, English poet Jane Taylor famously lamented that a little star’s twinkle left her wondering what it was. Fast-forward 207 years and a new analysis of starlight collected by NASA’s Kepler space telescope shows patterns in the flicker that are directly tied to the amount of boiling taking place on a star’s surface, a key indicator of its size, mass and evolutionary state. That information, in turn, reveals volumes about any orbiting planets, including those fortuitously positioned from their parent stars for liquid surface water, apparently a key ingredient for life. “Everything you know about planets is tied to what you know about the host star,” says Fabienne Bastien, an astronomy graduate student at Vanderbilt University. “That directly impacts whether or not you can claim that you have an Earth-like planet,” she says. Bastien, who is working on a doctoral dissertation, was analysing archived Kepler data for a totally different reason when she and colleagues chanced upon strange patterns in the data that they didn’t understand. “It was a complete surprise,” says Bastien. It turns out the pattern provides a quick and relatively reliable way to determine a star’s evolutionary state. Stars like the Sun, which is about 4.6 billion years old, eventually will evolve into red giants as they run out of fuel for nuclear fusion. The new study shows the surfaces of younger dwarf stars boiling more vigorously than older giants. “What we are looking at here is the gravitational acceleration in the stellar outer layers, what we often call the atmosphere,” says astronomer Joergen Christensen-Dalsgaard, with Aarhus University in Denmark. “The typical methods used have uncertainties up to 150 per cent. That very imprecise method is the easiest to do, and especially if you’re dealing with 150,000 stars and you need to characterise them all, that’s what you go to because it takes the least amount of resources. Our technique lets us beat that down to 25 per cent, which is very, very good for this field,” added Bastien. For Bastien’s study, which appears in this week’s edition of Nature, astronomers analysed a few thousand stars in the Kepler data archive. “If you have a large enough sample, then you start to pick out patterns in the way stars of different evolutionary states behave,” she says. While the study is based on eight-hour flicker patterns in the visible light coming from target stars, scientists translated the data into corresponding audio wavelengths, a poignant conceptualisation that no doubt would have intrigued, and delighted, poet Taylor. The Long and Arduous Quest to Find Flowing Water on Mars May Be Over. Most of these findings have involved either visual evidence for ancient, long-gone water or evidence for present-day ice, vapor or hydrated minerals. The discovery of actual liquid water on the surface, in the present day, could change the course of Mars exploration. Where there is water on Earth, there is almost always life. Confirming the existence of water on Mars would therefore greatly improve the prospect of finding extraterrestrial life. This is the story of continuing efforts to uncover what role, if any, liquid water plays on Mars today. High-resolution orbital imaging over multiple Martian years is revealing all manner of surface changes, some of which may involve liquid water. Surface features known as gullies were once thought to require the presence of water, but recent evidence suggests otherwise. A newly discovered class of features on warm slopes may mark the flow of salty water. These sites could be the best places to look for microbial life on Mars. A sleep expert explains what happens to your body and brain if you don’t get sleep. The average age for marriage in the UK is now over 30. Putting Cancer in Check: how to Destroy the Tumour Incubator. Science journal confirms eating turmeric cured myeloma cancer in 57-year-old woman.